I fully admit to being what you might consider a girly girl. I love lotions and potions. A venture into Sephora will never take me less than twenty minutes, even if I just need mascara. And I begin and end each day at my antique dressing table. Recently the Metropolitan Museum of Art in New York City had an exhibition entitled “Vanities: Art of the Dressing Table”. It showcased beautiful pieces and provided great information. I thought I’d share some of the highlights from the exhibition with you. The history of the vanity begins with decorative wooden boxes used by the Egyptians to hold cosmetics and grooming implements. 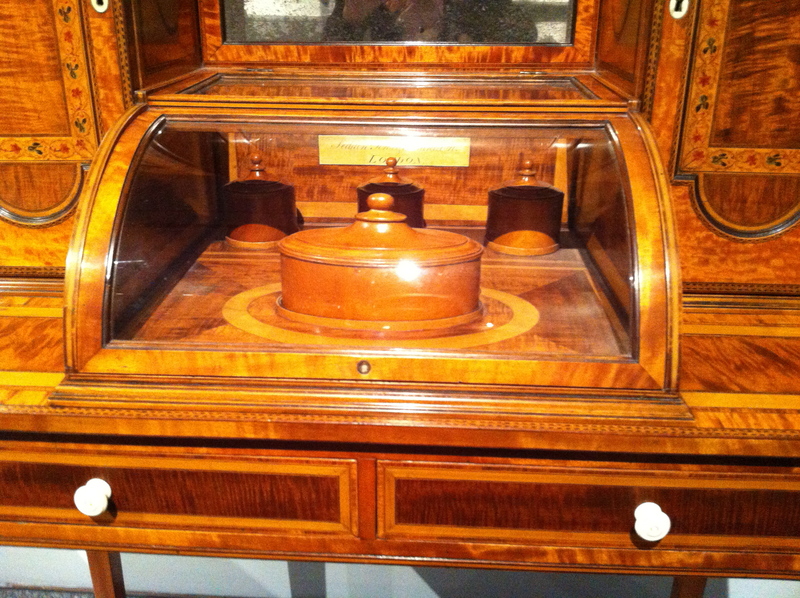 In Europe, the shift from these portable cases to the tabletop began with the evolution of the toilette. This term refers to the process of dressing and attending to personal grooming. The origins of the word toilette can be traced to the Middle Ages. 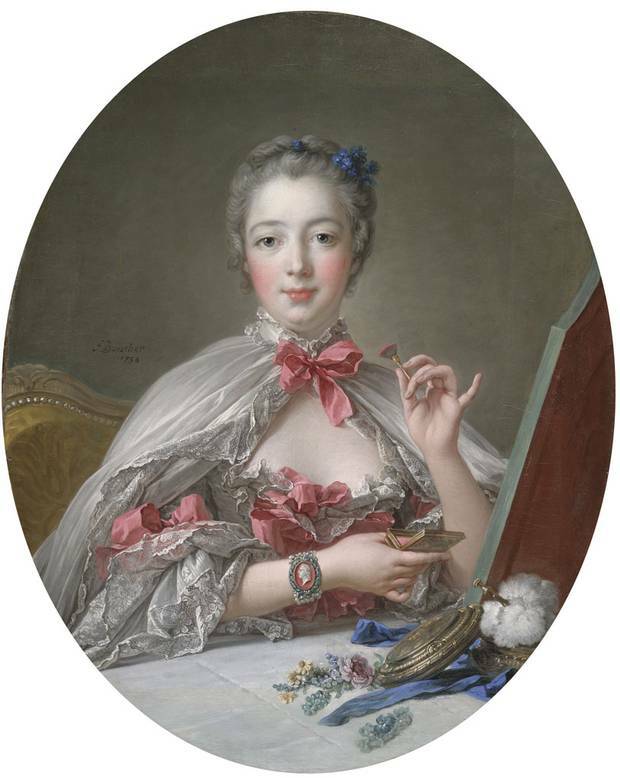 People began spreading a toile (French for cloth, or toilettes, as they became known) onto a table when they were serving meals, addressing correspondence, and applying cosmetics. For the purposes of dressing, the table would typically be draped with a simple cloth that reached the floor, and a more refined cloth or even a piece of leather was placed on top. 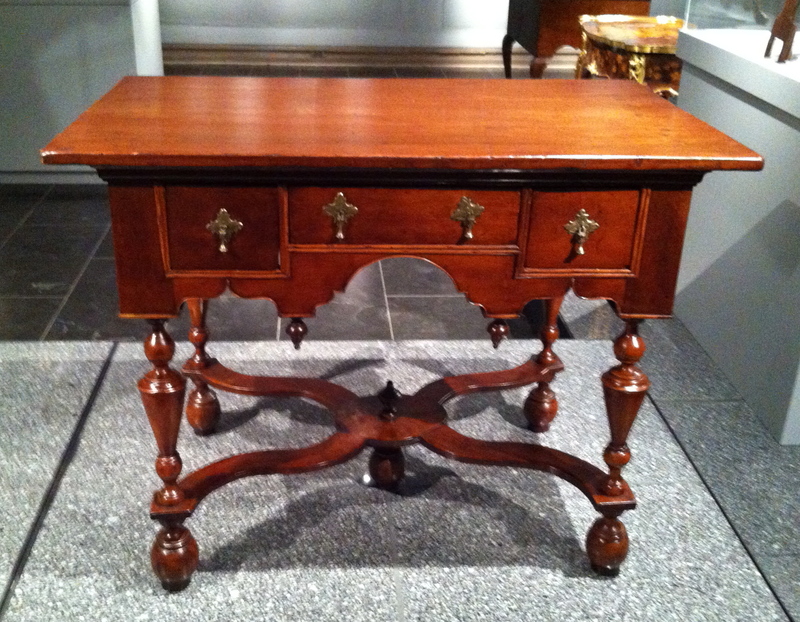 The dressing table as we know it today was developed in Europe in the beginning of the seventeenth century. By the eighteenth century, it became known as a mark of social standing as well as an object of fine design and craftsmanship. Two French women in particular helped to make the dressing table fashionable. The first was Madame de Pompadour (1721-1764), the highly influential mistress of King Louis XV. She popularized the once-private morning ritual of the toilette by sitting at her grand dressing table to receive guests. The other woman was Marie Antoinette (1755-1793), wife of King Louis XVI, who set the tone for matters of fashion, art, and design. American Dressing Table. ca. 1710-30. 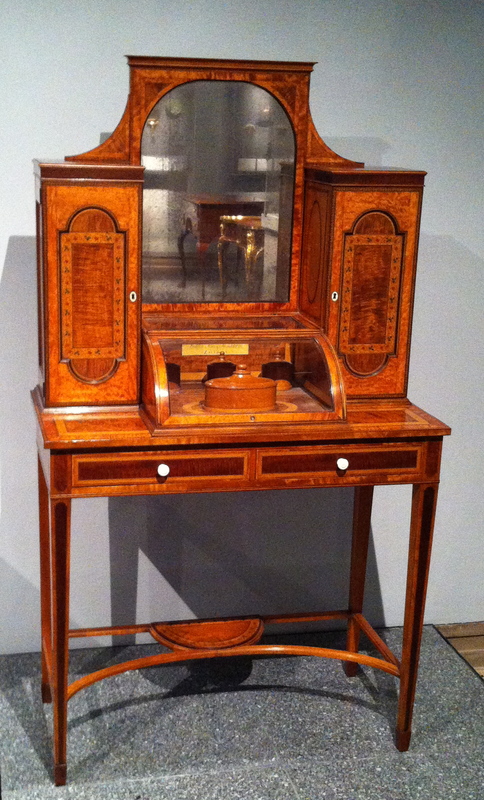 This dressing table was made in Connecticut and is characteristic of early American furniture. It is based on the Jacobean style prevalent in England during the reign of James II. It relies on the wood turning rather than elaborate carving for decorative effect. This combination table was designed by Martin Carlin, a German-born cabinet-maker who lived in Paris and made luxury pieces. It was made specifically to accommodate the needs of an aristocratic woman who might receive visitors while seated at her dressing table. This table features a removable upper section that could serve as a bed table, an adjustable mirror that could be reversed to form a bookrest, and lidded compartments in the shallow front drawer for storing toilette items. The lower section is a full-size table, complete with shelves that pull out in front and back. It has drawers on both ends that can hold equipment for dressing, taking breakfast, and/or writing. Work Table Attributed to Duncan Phyfe. ca. 1805-1815. 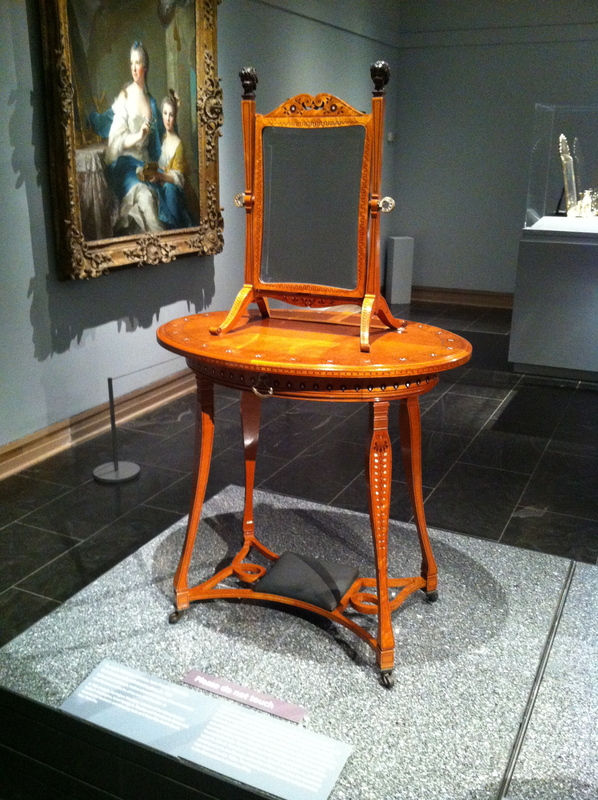 During the early nineteenth century, worktables were made for ladies. This example takes the form of American Neoclassical furniture, derived from the English Sheraton and Hepplewhite styles. It could serve as a sewing table, a writing desk, or a dressing table. The hinged top opens to reveal an adjustable writing panel covered in baize. 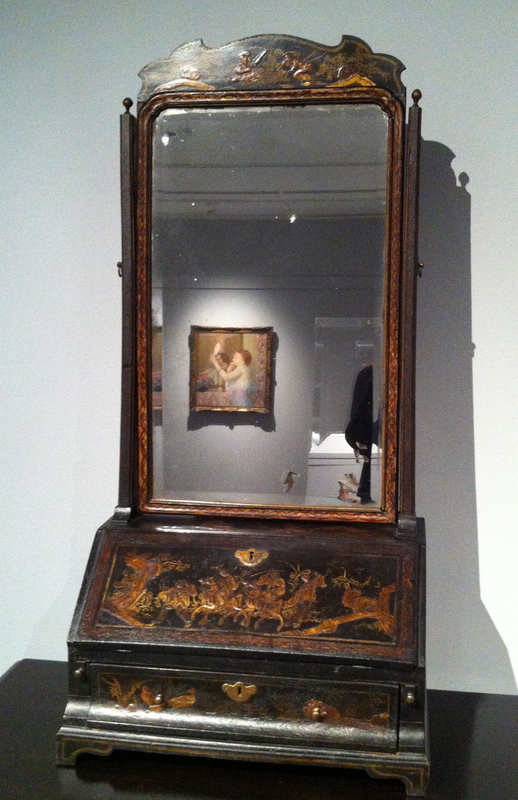 You can convert the writing desk to a dressing table by lifting a small leather tab behind the writing panel and pulling up a framed looking-glass. There are also two removable half-round compartmentalized trays at each end of the table that might hold knitting or needlework. The front drawers and space underneath the inner surface were designed to hold toiletries. Oval Dressing Table and Dressing Glass. ca. 1883. In 1881 Arabella Yarrington Worsham, mistress of the railroad tycoon Collis P. Huntington, hired George A. Schastey and Company to design and decorate her bedroom and dressing room in her New York City home. Schastey was one of several firms that created sumptuous custom-designed rooms and furnishings for wealthy American clientele. This oval dressing table was designed by Schastey for Arabella and features a removable mirror. The attention to personal appearance has never been restricted to women and men had their own requirements as time went on. During the second half of the eighteenth century, men were shaving at home aided by instructional manuals. 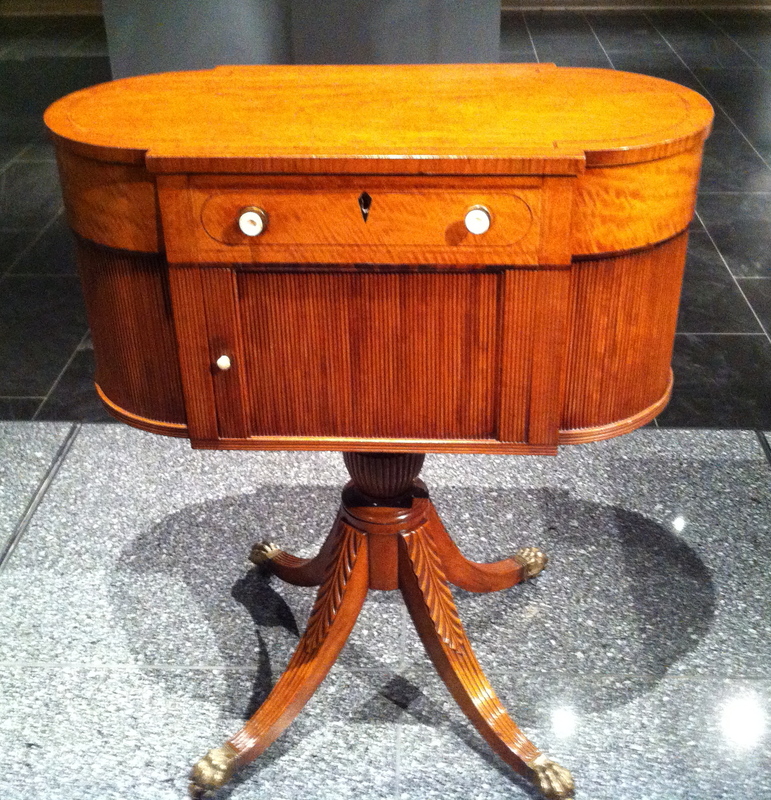 Specialized dressing tables and shaving stands were developed to meet men’s needs. Shaving Stand. English. ca. 1700-1730. This shaving stand, or toilet mirror, would rest on a table. It’s made out of maple, oak, beech, and spruce. Men’s Dressing Table. English. ca. 1790-1795. This dressing table, was made by Seddon, Sons and Shackleton of London, one of the foremost furniture makers of their time. It is in the British Sheraton style, popular in the 1790s and early 1800s. 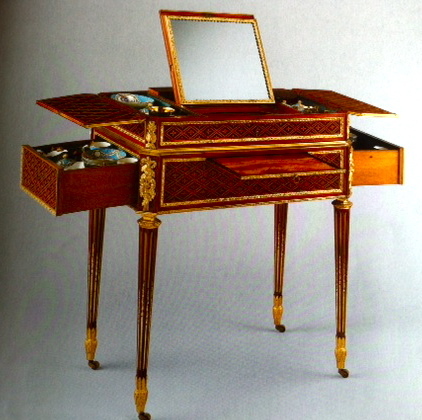 Since men generally attended to their grooming while standing, this dressing table is higher than a ladies dressing table would be. It contains four fitted wood boxes for the storage of shaving supplies and other implements. Within a semicircular glazed compartment the maker’s proud name has been inlaid in wood. The design of the dressing table also provides space for a basin and water. The mirror is placed at a height appropriate for a man who is standing. With pieces this beautiful, it’s hard not to want to primp. Next week I’ll show you what a lady kept on her dressing table.